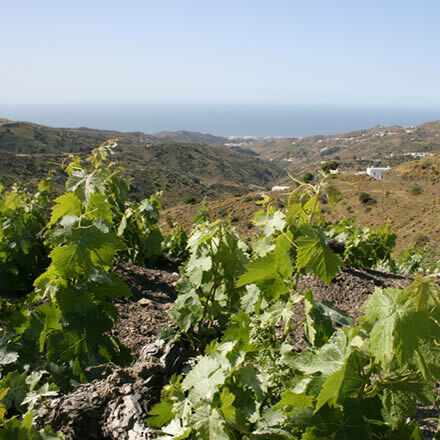 Our special care and attention is entirely focussed on traditional vine growing and the preparation of our wines. The muscatel grapes are picked with great care from the vine, and set out in the sun for drying in order to concentrate its sugars and highlight its sweet aroma. Without adding any artificial additives, the wine maturing process is based on the aging of natural ingredients in oak barrels. In the barrel cellar, the conditions and temperature of the wine-making process are continuously analysed and controlled and after various years the mature wine is temporarily transferred into stainless steel tanks until it is finally bottled. This exquisite ripening process guarantees the quality of the fine wine of Montes de Málaga. Visits will take place between October 15 and July 15, from Monday to Friday preferably in the afternoon. The visits will be booked, at least, 15 days in advance. The visits depend on the availability of facilities.